(Trent Nelson | Tribune file photo) Gov. 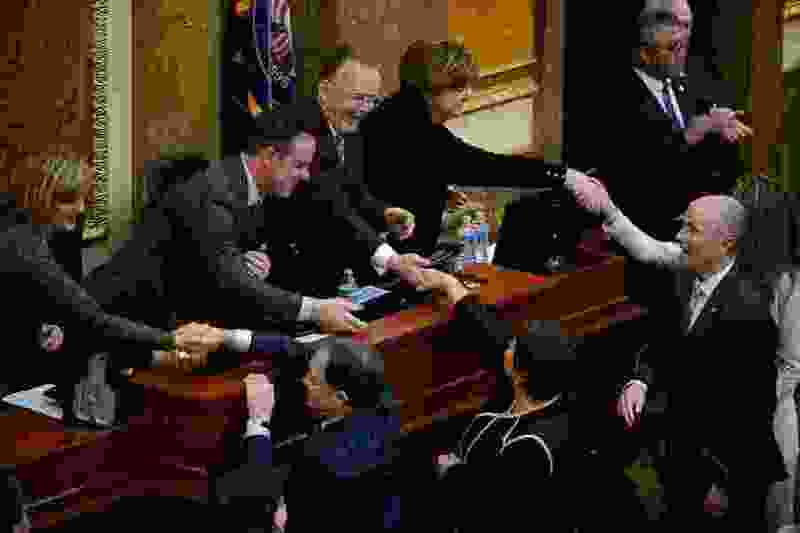 Gary Herbert shakes hands with lawmakers before delivering his State of the State address at the Utah Capitol in Salt Lake City on Wednesday, Jan. 30, 2019. He used the speech to pitch a $250 million tax cut and reform of the state's antiquated sales tax. Between now and March 14, lawmakers will decide how to spend an estimated $1 billion surplus from the state’s income tax, money that the Utah Constitution requires be spent on public education. But at least one outcome from the 2019 session is a virtual certainty: School funding will not increase by $1 billion. Gov. Gary Herbert’s budget calls for a roughly $500 million boost to public and higher education, generally similar to the budget requests of the Utah Board of Education and Board of Regents. And while education funding bumps typically differ from the surplus dollars in the education fund, the discrepancy is heightened this year by the sales tax effectively running dry, leaving scant dollars in the state’s general fund. That means the income tax is nearly the sole source of new funding for any and all government programs this year. The dynamics behind this year’s revenue numbers have produced seemingly contradictory narratives from legislative leaders during the initial days of the session. The state is too cash-strapped to enact a voter-approved Medicaid expansion initiative, they argue, while also flush enough to give $225 million back to taxpayers through a combination of tax reform and cuts. Beneath those efforts is a budget tool, which allows lawmakers to sidestep the constitution’s restrictions on income tax spending and spread around this year’s $1 billion surplus. But that tool, state leaders warn, could vanish in the near future unless immediate steps are taken. In 1996, Utah voters approved an amendment to the state’s constitution that added higher education — public colleges, universities and technical schools — to the permitted use of the income tax. Until that point, higher education was funded through sales tax revenue, with the education fund reserved only for grade school, or K-12, education. That amendment added flexibility to the state’s resources, freeing lawmakers to move general fund dollars in and out of higher education and buffer school spending from the ups and downs of the tax base. But in recent years, as fewer and fewer financial transactions have been captured by the state sales tax, lawmakers have increasingly withdrawn sales tax revenue from higher education for use on other programs, diluting the impact to schools of significant growth in the state’s income tax. Under the governor’s proposed budget, the amount of sales tax dollars in the higher education budget would shrink to roughly $40 million, its lowest point in decades. And Phil Dean, the governor’s budget director, said that without a restructuring of the sales tax, that $40 million will soon be wiped out, closing the flexibility between Utah’s education fund and general fund. If the door between the two funds were closed today, Dean said, then lawmakers would have only two options for the $1 billion surplus in the education fund: Spend it on education or cut taxes. That might sound good for schools, but there would be two corresponding options for the general fund: Cut funding for things like air quality improvement, health care and public safety, or raise taxes. The governor’s budget is only a recommendation. But with the bulk of new sales tax money already spent, most everything beyond education funded by the Legislature this year will require pulling sales tax money out of higher education and pushing the state closer to losing flexibility between the two funds. That’s one reason — as well as philosophical objections — that lawmakers say Utah can’t afford to implement full Medicaid expansion, as approved by voters in November, despite a $1 billion surplus. In December, the state’s budget estimates showed surpluses of more than $1 billion in the education fund and $254 million in the general fund. That same month, the Legislature held a special session and appropriated $235 million in general fund dollars for the construction of a new state prison. Updated revenue estimates are expected this month, but the December numbers would leave lawmakers with roughly $20 million of new money in the general fund to spend this year, not counting potential withdrawals from the higher education budget. • New general fund dollars from sales tax: $67 million (one-time); $187 million (ongoing). • New education fund dollars from income tax: $580 million (one-time); $488 million (ongoing). • General fund dollars spent in December: $125 million (one-time); $110 million (ongoing). Rep. Marie Poulson, D-Cottonwood Heights, said there’s a need to address the sales tax to maintain flexibility in the higher education budget. But that flexibility should be used to add to education, she said, not subtract from it. “What I don’t want to see happen is the cumulative effect of both [education] systems losing money because of our tax cuts or tax structure," she said. Poulson said she’s cautious about the talk of a $225 million tax cut — endorsed by Herbert and House Speaker Brad Wilson, R-Kaysville — because that would likely come in part or entirely from the income tax, which funds schools. The governor and legislative leaders have spoken positively about their efforts to fund public education over the years, she said, but Utah remains last in the nation for per-student funding appropriated to schools. The proposed tax cut is also opposed by the Utah Education Association. Heidi Matthews, UEA’s president, said a better use for the $1 billion education fund surplus would be a significant investment in class-size reduction and teacher retention. But while she opposes a tax cut, Matthews spoke in favor of reforming the state’s sales tax to relieve the pressure on higher education. In a prepared statement, Utah higher education Commissioner Dave Buhler spoke favorably of the Legislature’s discussions of tax reform, and said his office would be working with lawmakers on budget priorities for colleges and universities.